Wood & Torbert Families - Theodore Washington Brevard Jr.
Theodore Washington Brevard Jr. was born on 26 August 1835 in Tuskeegee, Macon County, Alabama. Theodore Washington Brevard and Caroline Elizabeth Mays appeared in the US federal census of 1 June 1850 in Leon County, Florida. Other members of the household included Theodore Washington Brevard Jr., Ephraim A. Brevard and Samuel Mays Brevard. He married Mary E. Call, daughter of Richard Keith Call and Mary Letitia Kirkman, circa 1860. Theodore Washington Brevard Jr., Lawyer, enlisted as a Captain 8 July 1861, Commission in Company D, 2nd Infantry Regiment Florida. Retired Company D on 10 May 1862, promoted to full Major September 1862 (as of 11th Florida Infantry), Commission in Company S, promoted to full Lieutenant Colonel 12 August 1863, promoted to full Colonel ca. 15 June 1864, promoted to full Brigadier General and discharged for promotion Company S, 11th Infantry Regiment Florida 22 March 1865, prisoner of war 6 April 1865 at Sailor's Creek, Virginia, Oath Allegiance 25 July 1865 at Johnson's Islan, Ohio (released). 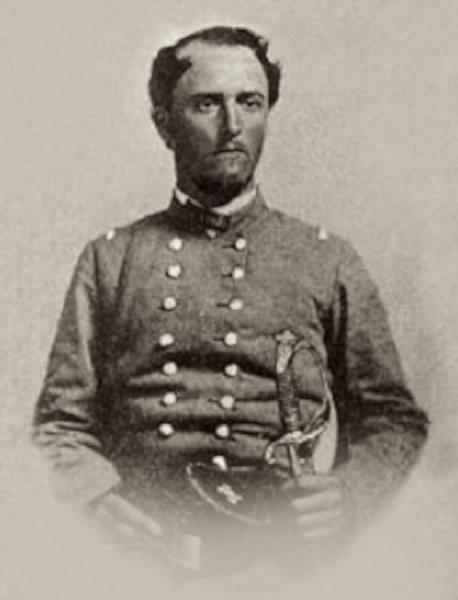 Brigadier-General Theodore W. Brevard, then in the rank of major, was commanding a battalion in the department of Florida in 1862-63. This was at first a cavalry command designated as Brevard's Partisan Rangers, and consisting of four companies. In the first months of 1861 Florida and South Carolina were considered the seat of war, and military commands were hurried in considerable numbers to Pensacola and Charleston. The latter city was the object of attack from 1862 to the close of the conflict. In Florida there was no important battle until Seymour's invasion in February, 1864. In a skirmish that occurred in the suburbs of Jacksonville on March 11, 1863, Major Brevard was commended for gallant conduct by General Finegan, who, in a report of a skirmish near Lake City on March 31st, says: "My orders were executed by Major Brevard with promptness, gallantry and discretion. In December, 1863, Brevard's battalion (the First Florida) had been increased to five companies, and Major Brevard had been promoted to lieutenant-colonel. This battalion was in the brigade of Gen. Joseph Finegan and participated in the battle of Olustee, February 20, 1864, the most important battle fought in Florida during the war. It was for the time decisive of the fate of that State, completely thwarting the Federal scheme for its conquest and reconstruction. When the Virginia campaign of 1864 opened, Finegan's brigade was sent to Richmond and participated in the battle of Cold Harbor, where it distinguished itself by recapturing, in a hand-to-hand conflict, the only part of the line where the Federals in their desperate charge made even the faintest show of success on that day, the most disastrous to Grant of his whole military career. In this battle Brevard led his battalion. In August, 1864, he was promoted to colonel of the Eleventh Florida, and in December he had command of that regiment and of Bonaud's battalion. On March 22, 1865, he was commissioned brigadier-general, a promotion richly deserved. Soon after this came the close of the war. Upon the restoration of peace General Brevard returned to Florida and strove to be as useful to his State under the new order of things as he had been when, as her valiant defender in the days of war, he braved the hardships and dangers of that fearful struggle which had so sorely tried the patience and endurance of the stoutest hearts. Up to the time of his death he enjoyed the love and esteem of his countrymen, and his memory is cherished by the people of Florida. Theodore Washington Brevard Jr. and Mary E. Call appeared in the US federal census of 1 June 1870 in Tallahassee, Leon County, Florida. Other members of the household included Caroline Brevard, Richard C. Brevard, Jane K. Brevard and Alice H. Brevard. He was a lawyer, according to the 1860 census. Theodore Washington Brevard Jr. died on 20 June 1882 at age 46 in Tallahassee, Leon County, Florida. His wife Mary E. Call became a widow at his death. He was interred at Saint Johns Episcopal Church Cemetery, Tallahassee, Leon County, Florida.